I know what you are thinking, I’m thinking it as well, it’s not nice to think about and I know you don’t want to say it, so I will – Hawick need a miracle to survive relegation this season. Saturday’s 60 points to 18 drubbing at the hands of Boroughmuir was the Greens’ seventh painful loss in succession, firmly rooting them to the basement level of the BT Premiership. The defeat casts Hawick seven points adrift of Marr, who are the latest side to occupy the relegation play-off places, and led to the club replacing head coach Darren Cunningham, who only joined the club in June, with former Gala boss George Graham. It’s been a wild seven days for everyone at Mansfield Park. Losing a coach mid-season is never easy and players this week admitted they failed to play up to their standards and feel responsible for Cunningham’s departure. “Look, I feel sorry for Darren as we as players basically didn’t play to the level we should have and it has led us to this situation,” said Hawick captain Bruce McNeil. “The club decided to make a change and we have to roll with it. “George has been with us for the past month and he has helped a lot. “He is a highly regarded coach and well respected around the game and hopefully the change can help us kick on. Change, whether it be a new house, car, mobile phone, energy supplier or milk brand can sometimes be refreshing and invigorate you to hit new levels of commitment, but it can also sometimes make things worse. Whether Hawick made the change themselves or Cunningham came to them first is unknown but the change has been made, unfortunately this change might be too late, and it actually might not be what is needed to get the Greens back on track. Hawick have barely come close to claiming a victory this season, except maybe the 19-23 Marr contest at Mansfield Park, but that’s up for debate. In the coming weeks the Greens have back-to-back matches against title challengers Ayr and Melrose, which look unfortunately likely to be losses, by which point Hawick could fall further behind the relative safety of ninth place. 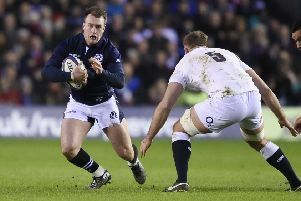 Despite the daunting schedule, McNeil intimated it was Hawick’s lack of professionalism off the pitch which is costing them, and led to the loss of Cunningham, rather than the play on it. “We all know that the Premiership is semi-professional and guys who play in it treat it as such, they train daily and make sure they do all their video analysis of upcoming opponents and study what they need to work on, we are not doing that as a team,” continued McNeil. “The club is living in the dark ages of Premiership rugby and we are seeing that play out on the pitch. “Boys are just training Tuesday and Thursdays with games on a Saturday. That, in today’s Premiership, isn’t good enough anymore. If that’s all they want to do then there is National Two and Three rugby for that. “We are a Premiership club and boys need to realise at this level you cannot get by doing the bare minimum. Seeing a team struggle like Hawick is never an easy watch. Everyone who follows the Greens wants them to turn this situation around. A coaching change mid-season is like dealing with a highly combustible substance. Sometimes it does what you want, sometimes it blows up in your face.